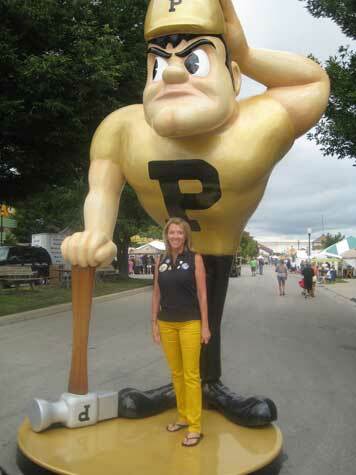 First Lady Cheri Daniels at the 2012 Purdue Day at the State Fair. Cheri Herman Daniels, a lifelong Hoosier, was born and raised in New Albany, Indiana. She is the granddaughter of Baseball Hall of Famer, Billy Herman. Cheri attended Indiana University where she studied journalism. During her time as first lady of Indiana, Mrs. Daniels formed a partnership with the Indiana Department of Health in helping to raise awareness about women's heart disease. She has also focused much attention on supporting heart screenings. She is a member of the advisory board for the Indiana Heart Hospital and the foundation board for Community Hospitals. In addition to advocating physical fitness for all Hoosiers, she also supports the "I love to read” program and other efforts to encourage education and literacy. The first lady and her husband, President Mitch Daniels, have four daughters: Meagan, Melissa, Meredith and Margaret.The first lady views her most important job as being a mother and wife. She enjoys reading, golfing, exercising, cooking and spending time with family and friends.